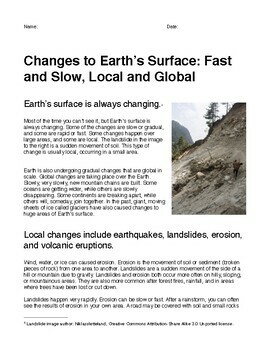 Earth's surface is always changing. Some of these processes are slow, and happen on a global scale or over very large regions. These include plate tectonics and the movement of glaciers. Others, such as volcanic eruptions and earthquakes, happen rapidly. This events, may be dramatic and cause loss of human life, but they tend to change the surface of the land only in local areas or smaller regions. This two-page reading was designed for middle school and is at a 6/7 reading level. Students are asked to show comprehension by organizing notes gathered from the reading in a T-chart. 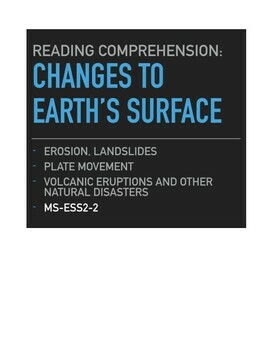 NGSS MS-ESS2-3.